This Easter was such a blast. My side of the family came to visit from Layton, and it was wonderful being able to spend the day with them. I went to church with the kids- which let me tell you, It’s HARD watching two toddlers alone at church. haha My husband was out of town, and it’s the first Easter we have ever spent away from each other! Thank goodness for modern technology. We were able to talk and send pictures all day. 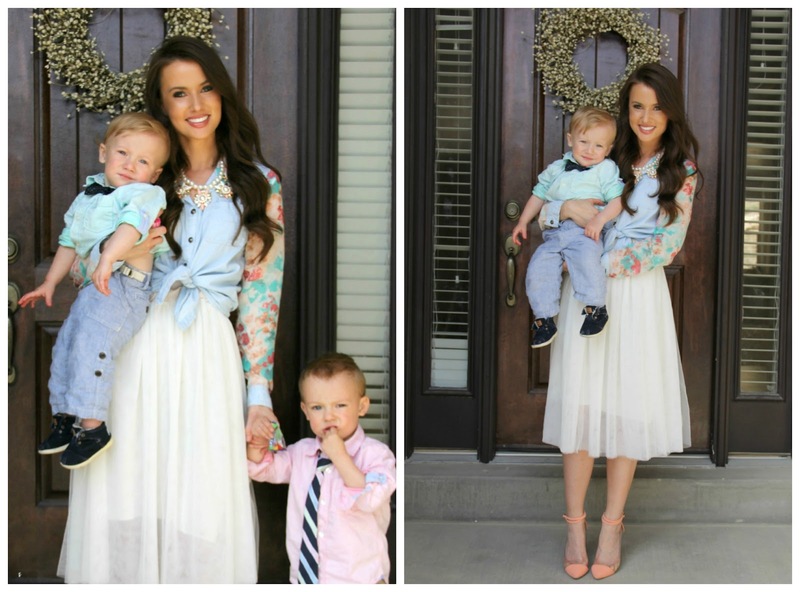 I was so glad I was able to find an outfit to match the boys Easter outfits, thank you Poppy and Dot and Marilyn & Beverlys for saving the day! I sent my Easter skirt with my husband to Nashville by accident. Whoops! Once we got home from church, my sister and her family showed up, along with my other two sisters. Cayman was in Heaven playing with his cousins. He loves them and ignores me when they are around. Who needs mom when the cousins come to play!? Beckham on the other hand was joint at my hip as usual. He’s such a mamas boy. I hope he never grows out of it. 🙂 We had a big bbq, had an Easter egg hunt with all of the kids, made Easter cupcakes, watched Easter movies, and dyed Easter eggs. The kids even had a little “bubble party,” it was the cutest thing watching Beckham laugh at all the bubbles. He was mesmerized! Such a perfect day celebrating with my amazing family. Every Easter I cant help but feel overwhelmed with gratitude for all of my many blessings. A husband who supports me in all that I do, two adorable little boys who make me laugh and smile every day, a roof over my head, food to eat, and so much more. Celebrating Easter is not just about gathering together as family, the easter egg hunts and the candy. It is so much more than that. I know that Christ lived and was resurrected. I know that he died for our sins, so that we could one day return to our Heavenly Father. It is because of our loving savior that I am able to be a wife and a mother to my two little miracles. I am grateful for him every day. I hope you all had a wonderful Easter, and were able to remember the true meaning behind it. Hahaha! Thank you! That's my niece Lissy. Isn't she the cutest?? My sister will probably kill me for posting it, but it makes me giggle every time! Love your Easter outfit! Sounds like you had a great day with family. Church would be hard on your own! Your Easter post sounds a lot like mine and how I was feeling this Easter. Having kids makes it soo much more magical and you realize how MUCH we are loved by God to be blessed with beautiful babies and great families all around.